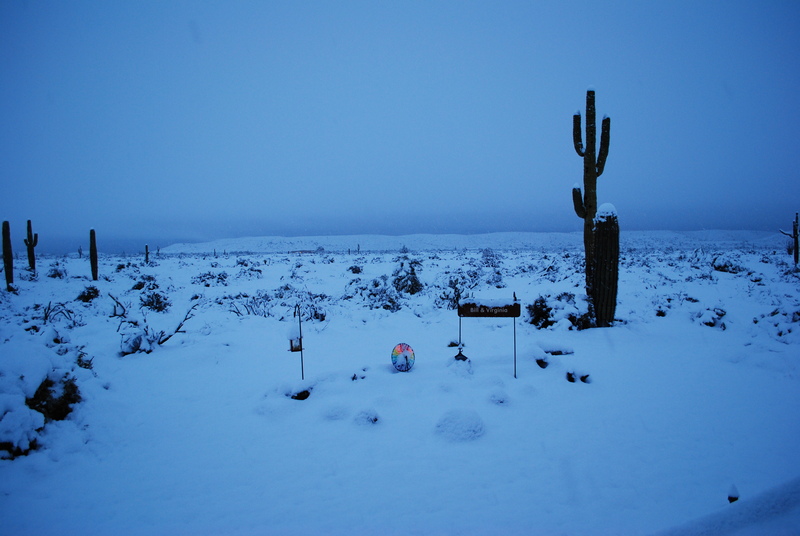 Thursday, 2/21/19, will stay in my memory book forever.. That is the day I woke up to six inches of snow right here in our campsite at McDowell Mountain Regional Park. 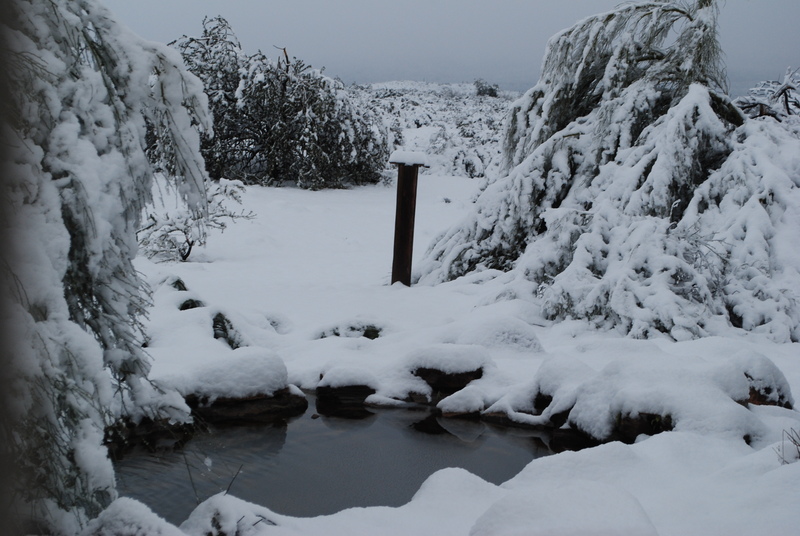 When I went to bed Wednesday night, it was cold and raining, but nothing like what I hadn’t seen before. 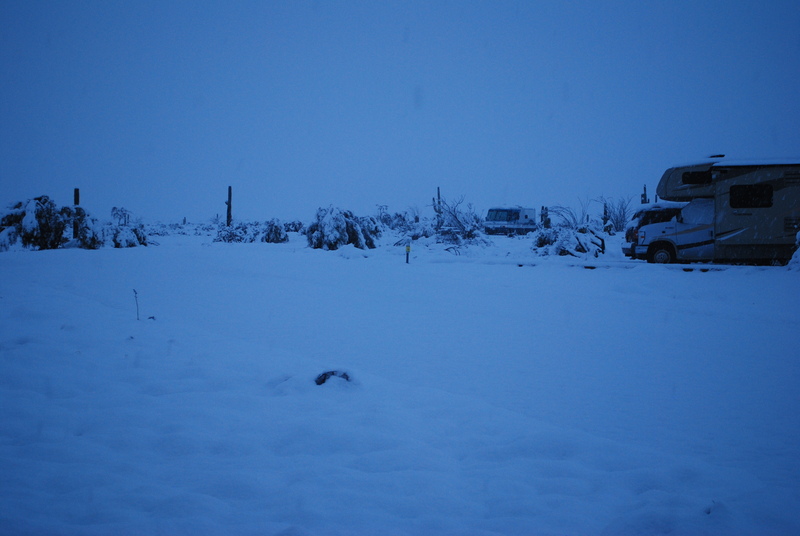 But that all changed during the night when at approximately just 1700 feet elevation, it snowed! 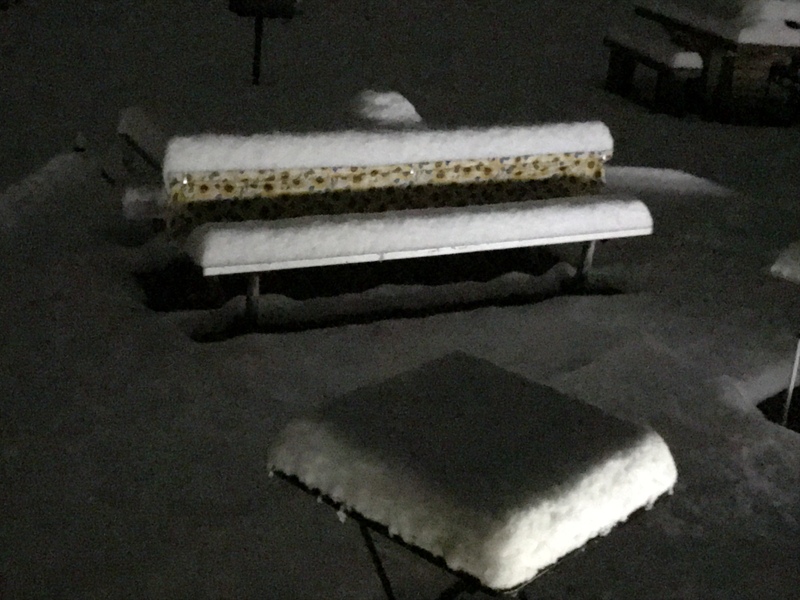 I couldn’t believe my eyes when I got up at 5:00 a.m. and looked out our bathroom window. I yelled at Bill to get up, and look outside, because there was snow everywhere. 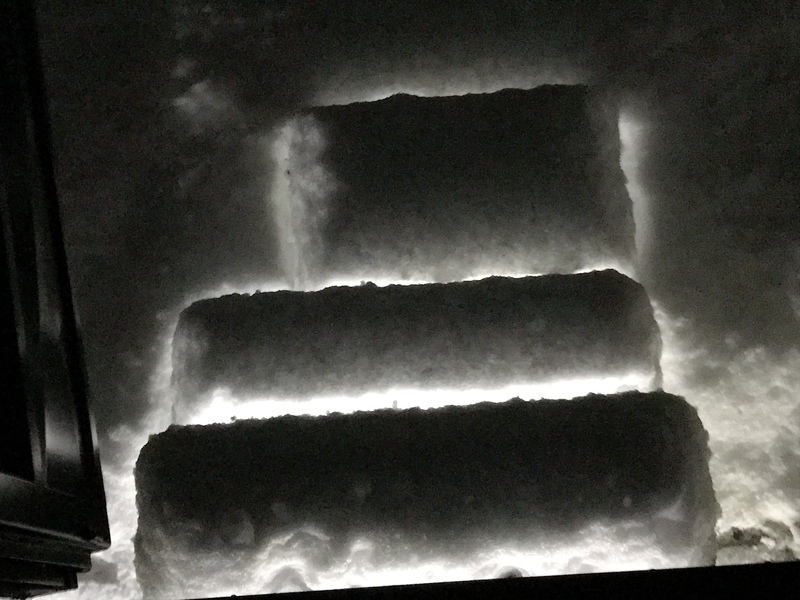 The next picture is of our steps leading out of our motor home. Well, you have to know I grabbed my camera and started taking pictures like a wild woman. I was so excited, but confused as well. The whole park was covered in show. 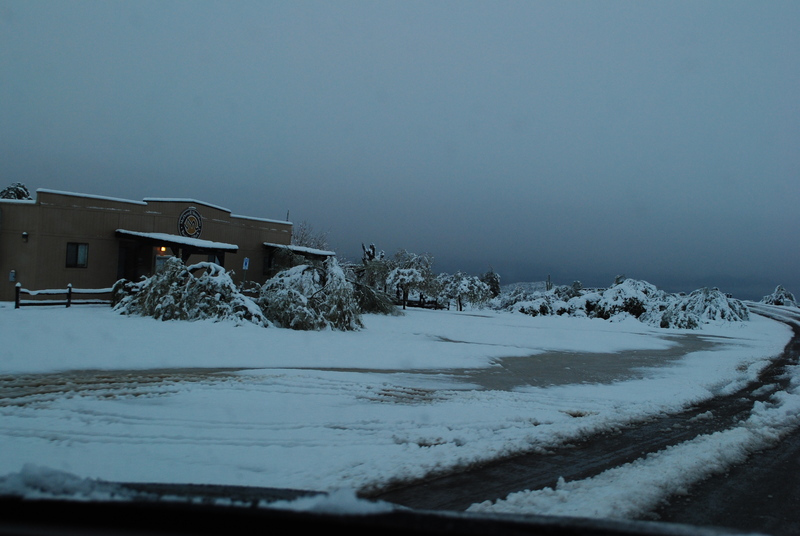 Here is what the road through the campground looked like as we were making our way to work at the Visitor Center. 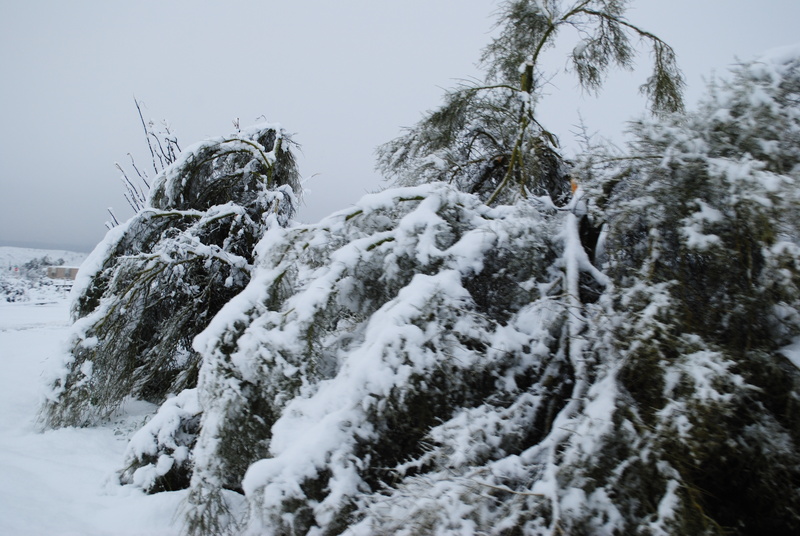 Then we started noticing several of our beautiful Palo Verde trees that were down due to the weight of all the snow. 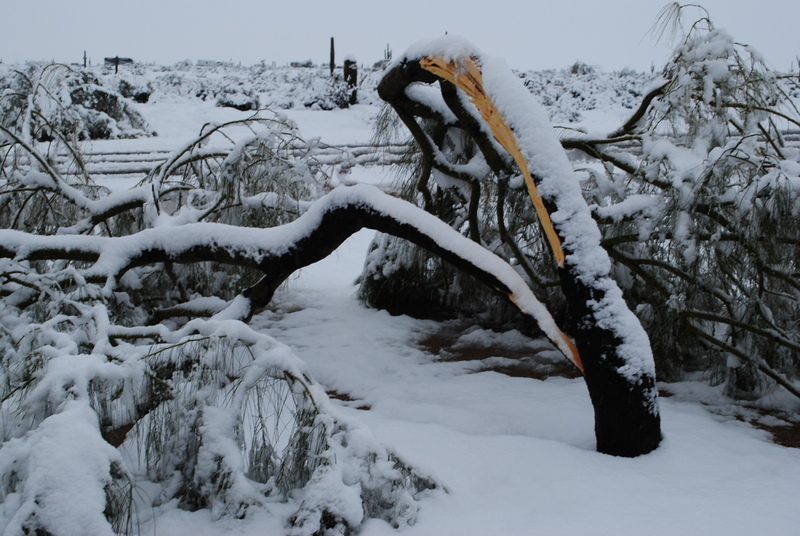 The two Palo Verde trees in front of our Visitor Center were toppled over from the snow, and even the trunks of those trees were split down the middle. One for the trees at the Visitor Center was so badly damaged, it had to be cut completely down. 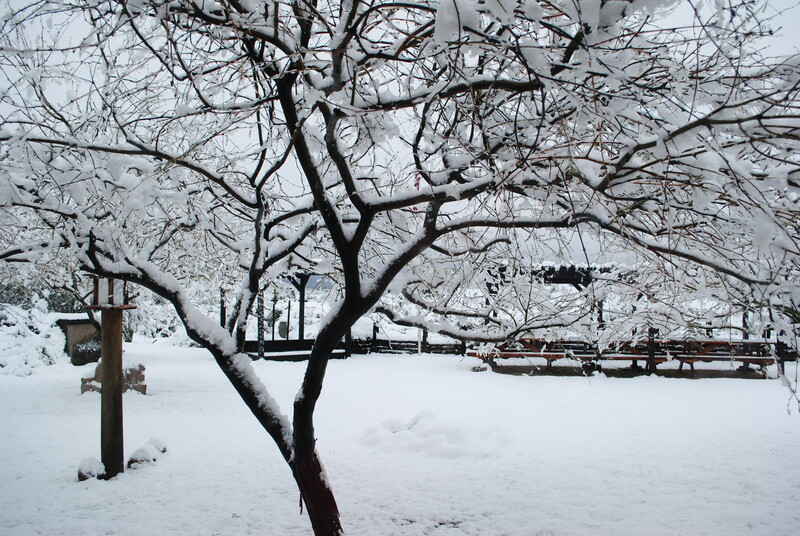 This was the scene looking out over the picnic area beside the Visitor Center. And this is looking out the back window of the Visitor Center where the critter pond is. 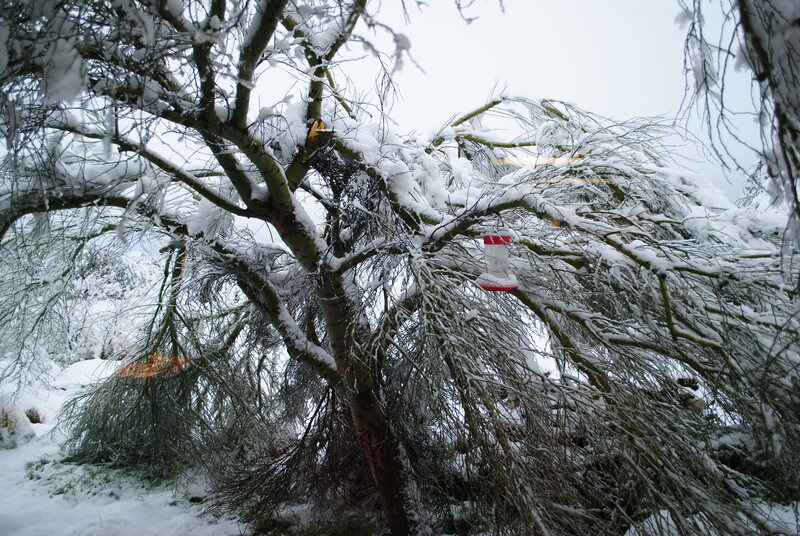 This is the tree where all the humming birds come to get drinks from our humming-bird feeder. 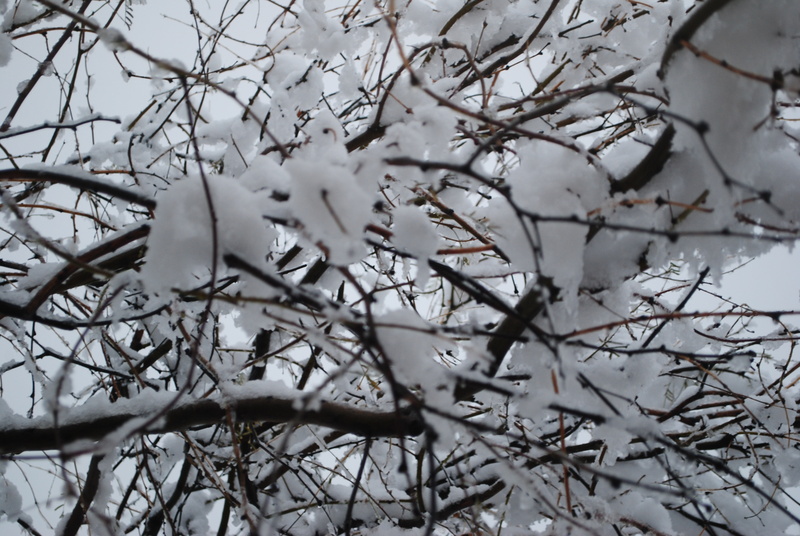 The branch holding the humming-bird feeder was laying over on the snow-covered ground. To protect the trails within the park, all the trails were closed to mountain bikers, and horseback riders. Only hikers were allowed out on the trails. 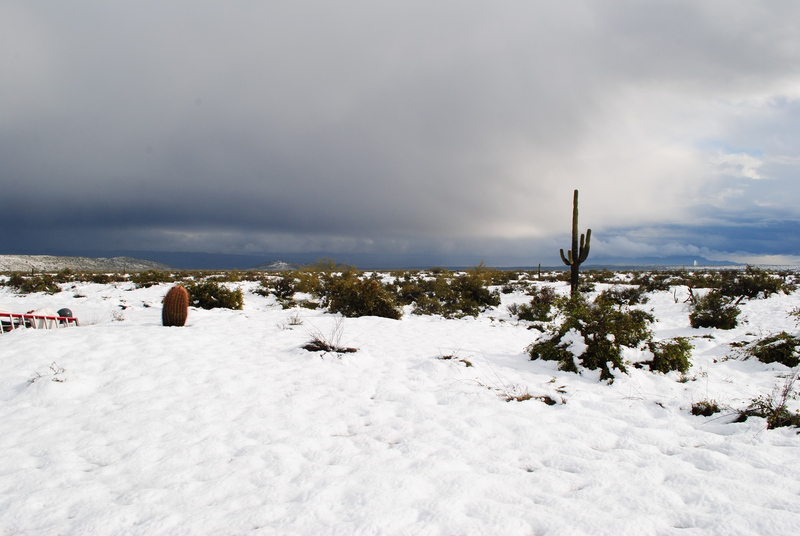 And people came all day long, from all around the valley, to see the snow at McDowell Mountain Regional Park. 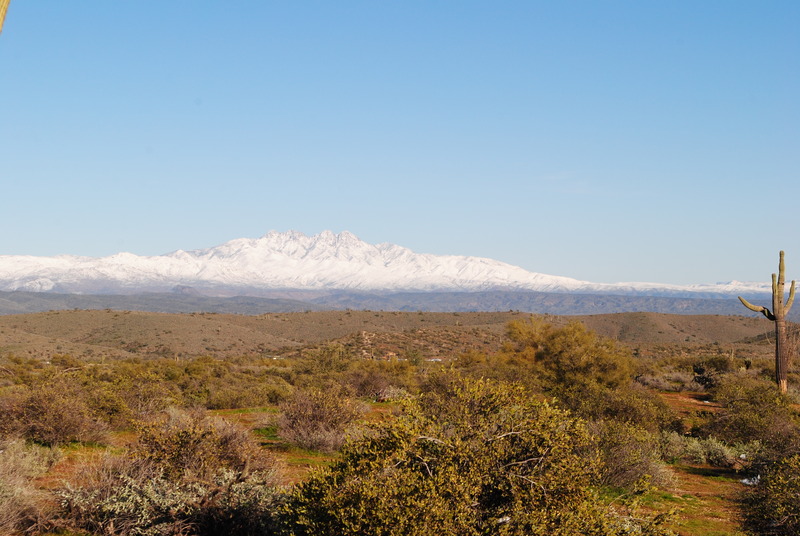 Here is a picture on Friday (day two of snow in the park), of the McDowell Mountains taken from the front of the Visitor Center. 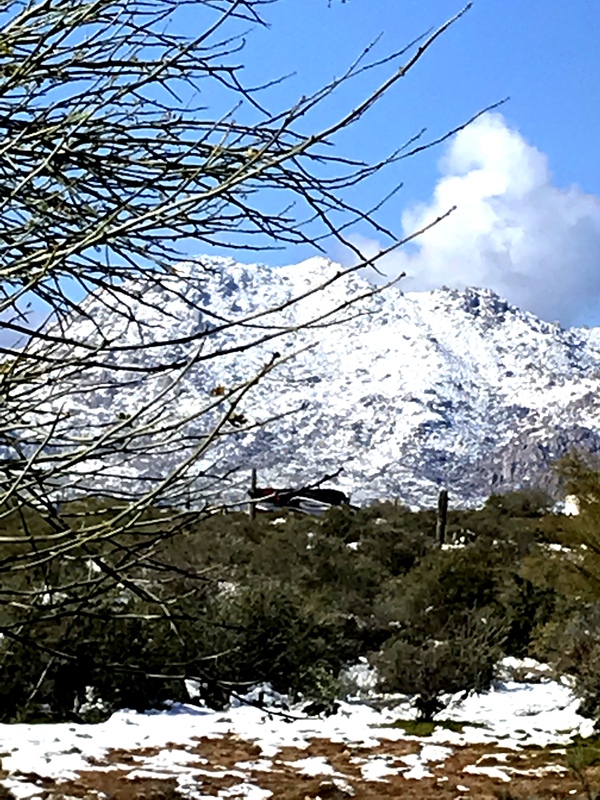 By now the snow had started to melt somewhat, but it was still cold enough outside to keep it around until Sunday on the ground, and it is still covering the McDowell, and surrounding Mountains. If you know me, or follow my blog, you know I am NOT a cold weather girl. NO, I do NOT tolerate cold weather well at all. 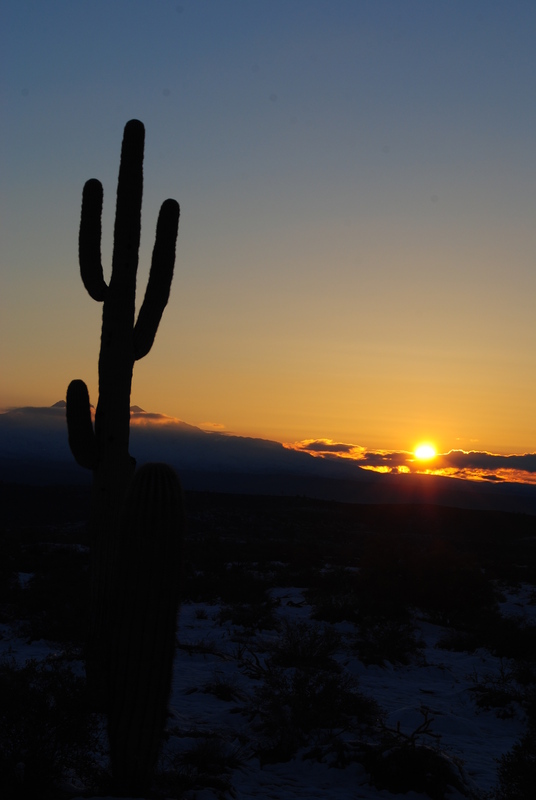 I LOVE my dry, warm, desert and lots of sunshine. 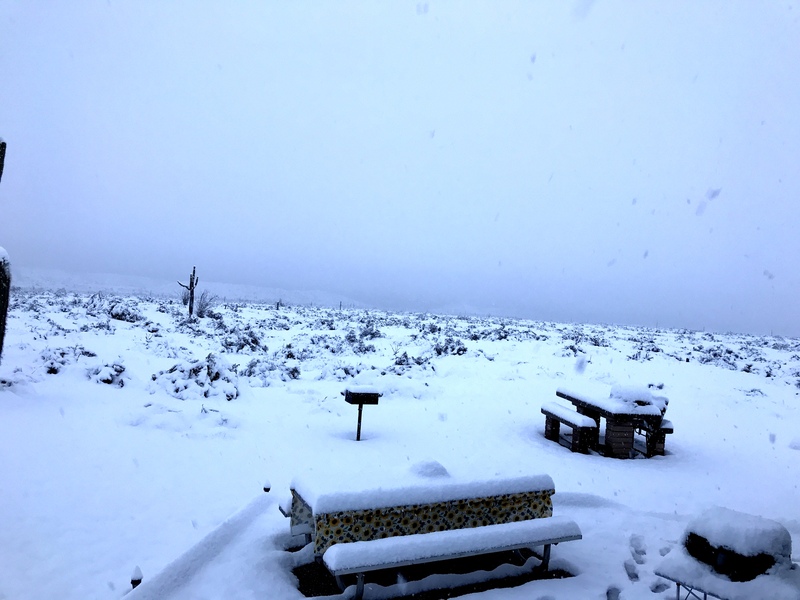 So while I was excited, and confused, to see all the snow here in our desert park, I found myself feeling kind of down, and anxious, by the second day of the gray skies and snow on the ground. 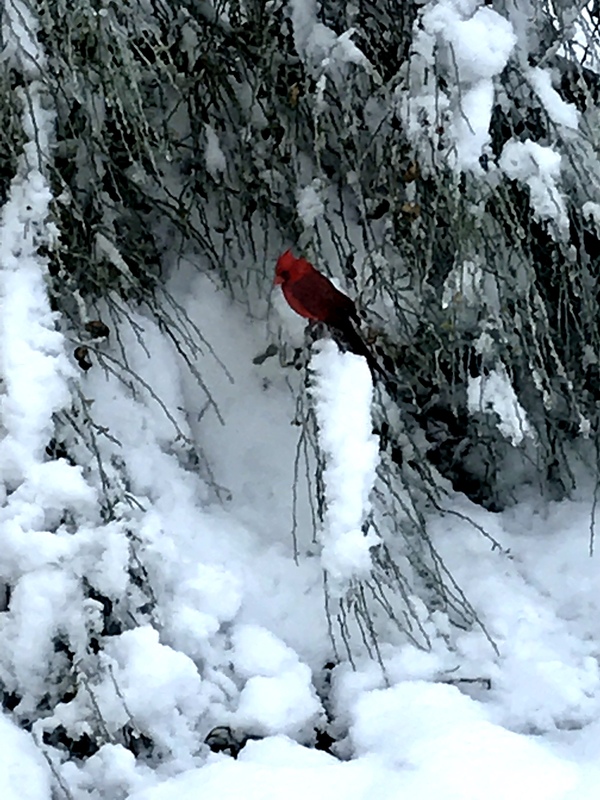 This beautiful little Cardinal stopped by to say hello, and that was a bright spot in one of my day’s. What ever happened to the days when people went to work, and did the job they were paid to do regardless if it is your dream job, or a job you are doing until you find your dream job? 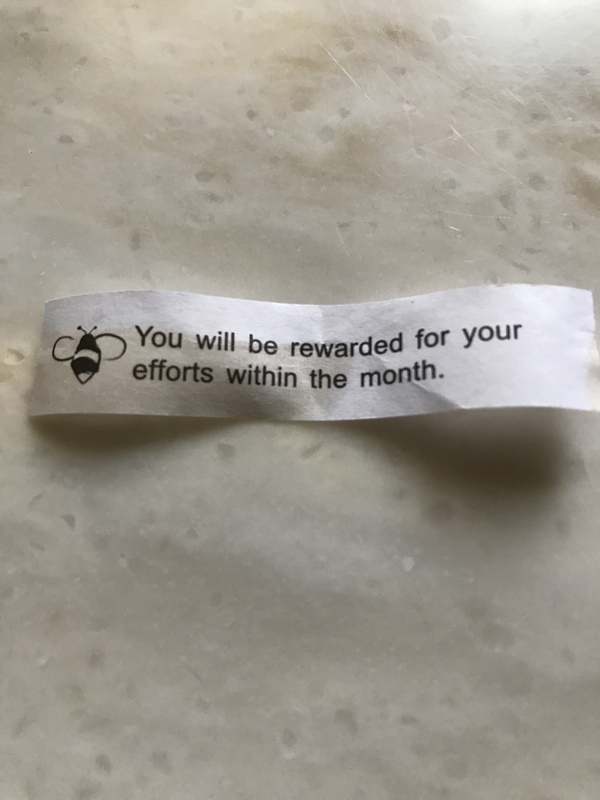 What happened to showing up to work everyday and providing the best customer service you can provide, because you signed on to give your best when you took the job you have now? If you follow my blog, you know my husband, Bill, and I, have a daughter, Shantel, that is totally blind, but she has never let that get in the way of her living her life to the best of her ability each and everyday. She has a job in a call center, that just so happens to be in the customer service field, and she shows up everyday anxious to do her best to provide the best service she can for each and every call she takes. The past two weeks Shantel has been working a lot of overtime, because the main call center for the company she works for is located back east, and they have been hit with extreme cold weather, that caused a lot of folks to not be able to make it into their jobs. So, all the east coast calls were rerouted to the Phoenix based call center where Shantel works. This caused Shantel to have to work ten-hour days, then deal with the two-hour Dial-a-Ride ride service two and from work. Dial-a-Ride is another whole nightmare story, in regards to customer service, but that will have to wait for another blog posting. When I talked to Shantel today, she told me that last night she decided to treat herself when she finally got home from work, and use Uber Eats, to order her food and have it delivered to her. I Googled Uber Eats and found the following information. “Uber Eats is a food delivery platform that makes getting great food from your favorite local restaurants as easy as requesting a ride. Uber Eats is the easy way to get the food you love delivered” Shantel has used Uber Eats several times in the past with no problems. So, because she was tired, and just wanted to order her food, eat, take a shower, and go to bed so she could get up and do her job well again the next day, she called Uber Eats and placed her order. She told me she always tells them she is visually impaired, and needs to have her order delivered to her door. In the past, this has never been a problem. However, last night, the driver called her when she was in the parking lot of Shantel’s apartment complex, and told her she didn’t want to walk to Shantel’s door with the food because it was too dark… She told Shantel she would leave her food order in the parking lot and left!! There is no way Shantel could have ever found her food order in the parking lot, and there is no way she should ever have to do that. Shantel called and made a complaint to the Uber Eats customer service line but they just told her “they will look into it”. I am beyond appalled at the lack of not only customer service by Uber Eats, but also the lack of common decency, for our fellow human beings ,by the Uber Eats delivery driver that told Shantel she would leave her food order in the parking lot and left, even though she knew Shantel is blind. If that woman was afraid to deliver the food order to Shantel’s door in the dark, perhaps she shouldn’t be working for a delivery service at night! Shantel has also used Grubhub, which is another food deliver service, and found them to have excellent door delivery service. However, Grubhub doesn’t deliver from some of Shantel’s favorite restaurants. Of course as her mother, I’m always upset when I hear about some of the obstacles Shantel has to deal with in her daily life. I know we all face obstacles in our lives, but sometimes I just think Shantel gets her share, and then some… However, being the beautiful, old soul ,that she is, Shantel never lets any of it get her down. She just keeps on going ,and makes the very best of what she has to work with… I asked her what she did for dinner last night since it was late, and her food order (that was already paid for) was left somewhere in the parking lot, and it was too late to start cooking dinner…? She laughed, and said “lucky for me, I found a can of soup in the cupboard”. That’s our girl! We love you Shantel. I’m not one to visit gravesites of the deceased. I don’t believe they are there in the grave so I see no reason to visit the gravesite. When my father died in 2006, I took my mother to visit his grave, and she would always take flowers to place on the grave. When my mother died, in 2016, and the graveside service was over, I never went back to visit her gravesite again. Again, I don’t believe she is there so what is the purpose of visiting the gravesite…? 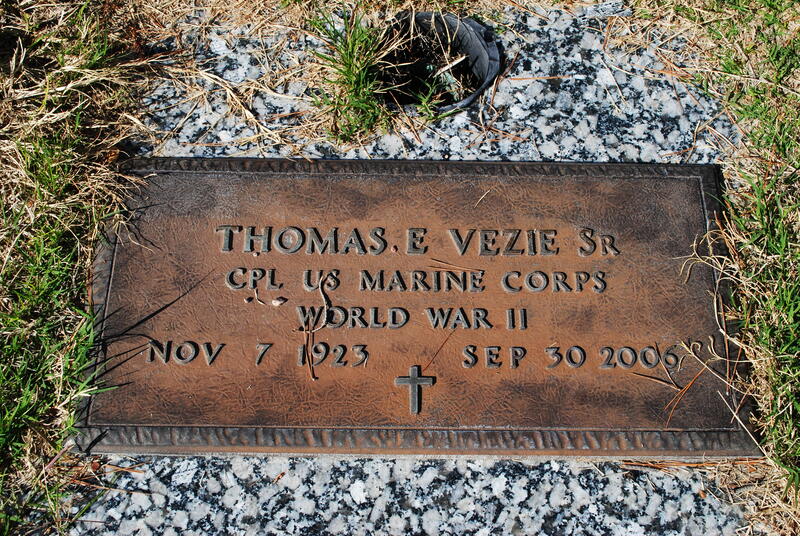 However, for the past few months, I’ve had a nagging feeling urging me to go and visit my mother’s gravesite. I shared my feeling with my husband, Bill, but again I reminded him that I don’t believe in visiting the gravesites of the deceased because they are not there… But today, Bill, suggested we take a ride to the cemetery to visit my mother’s grave. I agreed, and off we went. Well, imagine my surprise when we arrived at the gravesite of my parents, and my mother’s information was not on the grave marker, three years after she has been dead! 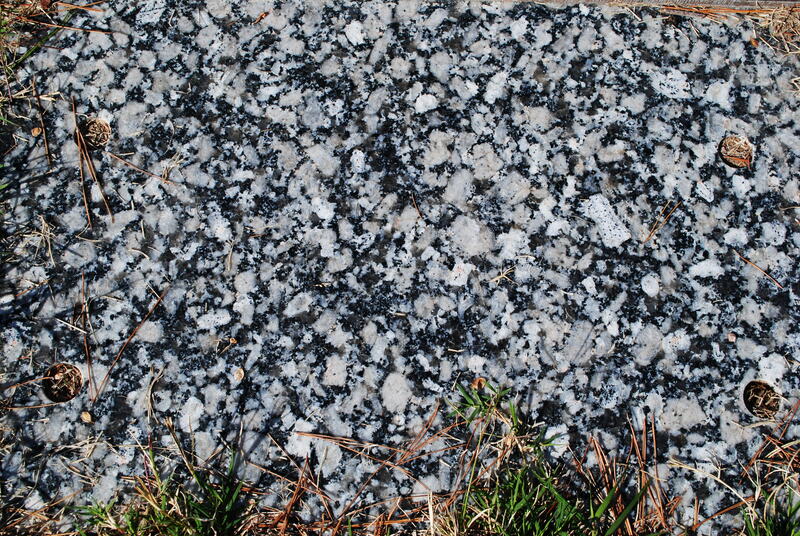 You can see the holes in the stone where the information marker is to be placed, but no marker is there. So off we go to the office to find out what happened. 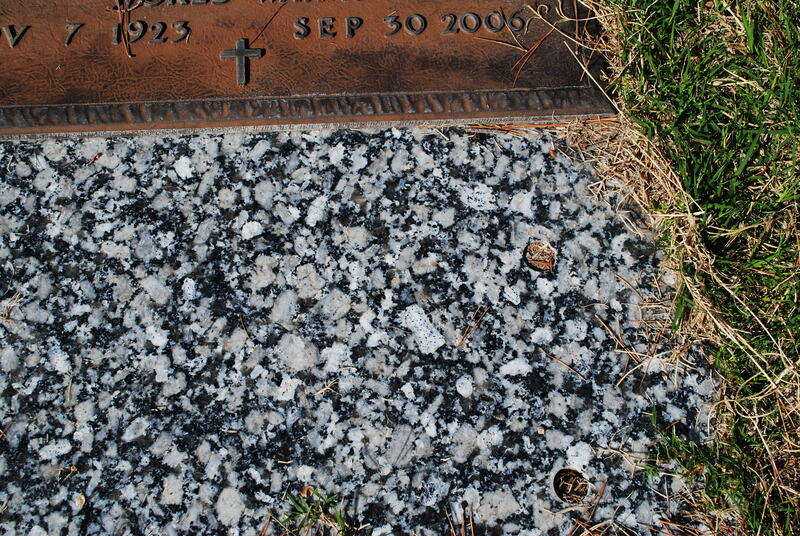 Why was my mother’s information not on her gravesite stone? 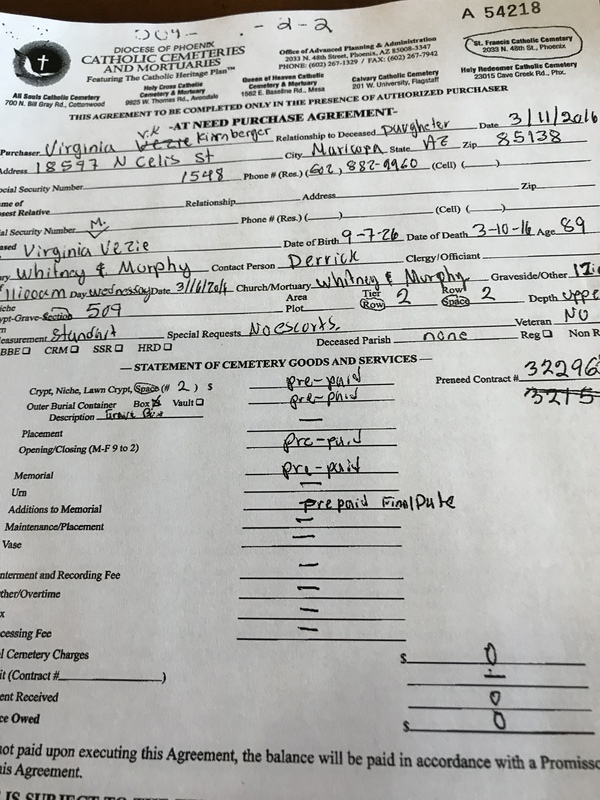 The manager showed us on the paperwork where the person (that was no longer working at the cemetery office) wrote on the paperwork when we met with him the day after my mother died which was 3/11/2016, “pre-paid final date (shown in the middle of the next photo. The manager said perhaps he was waiting for the final date to put on the gravesite marker.. Well I might not be the sharpest tool in the toolbox, but I know that the final date would be the date of death which for my mother was 3/10/2016, which is also listed on the paperwork. So instead of anyone picking up the phone to call and clarify, they just did nothing, and so my mother’s gravesite has gone unmarked for three years and counting… Had Bill and I not gone to visit the gravesite today, her gravesite might have stayed unmarked forever! After a lame attempt to try to explain what might have happened, the manager looked at me, and most likely saw I was not buying any of it so he finally said “there is no excuse, this is entirely our fault, and we are going to order the gravesite marker with your mother’s information today. We will email you the proof for you to approve, and we will install it as soon as it comes back to us. He even offered to give us a memorial inscription free. I told him I wasn’t looking for anything free, I just wanted them to make her gravesite marker as we agreed upon in the first place which was to have her name, date of birth, date of death, and a cross to match my father’s marker. So now we wait… it can take a couple of weeks to get the proof to approve, then 8-10 weeks to get the gravesite marker back and installed on her grave. That will put Bill and I into our time to leave Arizona, and make our way to South Dakota. So, because I have been reminded yet again that we have to follow-up on everything, and leave nothing to chance ,and hope good, quality, customer service will prevail… I asked them to take a picture of the gravesite marker when it is installed on my mother’s grave, and email it to me so I know it actually got properly installed this time.